What’s up all my dude's and dudette’s! It's been a while since I've posted a blog since I've been busy with break and life in general. 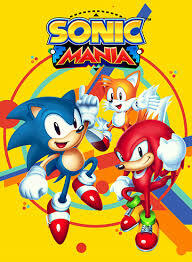 This blog is a follow up from the last blog that I posted on the new Sonic game that just came out, Sonic Mania! After playing this game more over the semester break and really diving into it, I must say that it really does pay homage to the Sonic games of old. I felt like I was 8-years-old again playing on my Sega Genesis, trying to collect all the chaos emeralds to unlock Super Sonic. I haven't gotten this feeling from other recent Sonic games, so it was like a breath of fresh air. I've already logged about 20 hours in the game and I'll definitely log more. To touch on the gameplay, I felt that it was very snappy and crisp. The game runs at 1080p 60fps in console mode and 720p 60fps in handheld on the Switch. The controls felt tight with the inputs feeling instant. One feature that I really enjoyed was that I could play local multiplayer with a friend. I tested this out with my brother and we both had a great time racing each other. The story mode was really a joy to play though and although I felt like I had fought some of the bosses in other games, they were enjoyable. I think this was a great addition to the Sonic franchise and I can't wait for the next Sonic game to come out in the future!